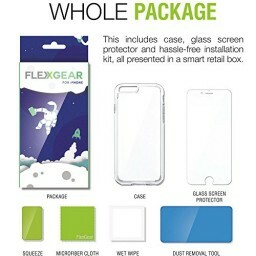 PROTECTIVE AND SLIM CASE FlexGear case features hybrid technology constructed from two components: a shock-absorbing anti-bump TPU bumper and a crystal clear scratch-resistant PC back cover. 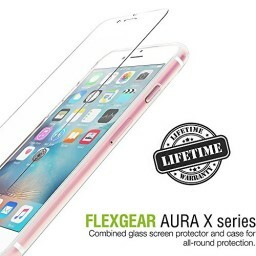 ULTIMATE KIT Everything you need for true 360° protection of your iPhone 7 is right here! 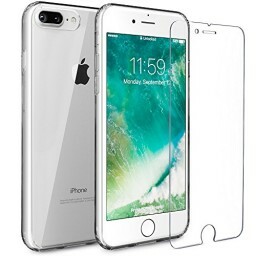 PROTECTIVE AND SLIM CASE FlexGear case features hybrid technology constructed from two components: a shock-absorbing anti-bump TPU bumper and a crystal clear scratch-resistant PC back cover. Case features air cushioned corners and raised lip over screen & camera for better protection if your phone is dropped. 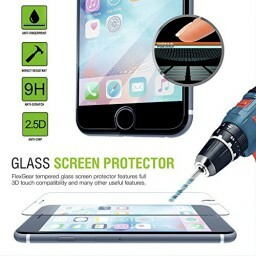 PREMIUM GLASS SCREEN PROTECTOR FlexGear tempered glass screen protector features: 3D-touch support, oleophobic and anti-fingerprint coating, 9H hardness for maximum protection, shatter-proof, HD clarity, easy installation. Installation tools included: microfiber cloth, wet wipe, dust remover sticker, squeeze, installation guide. Please note: due to the rounded design of the iPhone 7 screen, the glass screen protector does not cover the entire screen.